District 7: Property Tax Workshop in Leon Valley! LEON VALLEY FIESTA MEDALS ARE HERE! 25th Annual Basura Bash River and Waterway Clean-up!! Annual Christmas Tree Lighting Ceremony! Breakfast with Santa! This Saturday 12/01/2018. Daylight Saving Time: Don't Forget To "Fall Back" This Weekend! 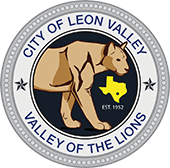 Household Hazardous Waste Program Still in Effect for Leon Valley! Evers Road Bridge Project Speeding Up! **UPDATE** Reunited. Dog is home safe and sound. Leon Valley 4th of July and Fireworks Spectacular!!! Leon Valley 4th of July & Fireworks Spectacular! Leon Valley Pools Open Memorial Day Weekend! FOURTH OF JULY PARADE ENTRY FORM NOW AVAILABLE! National Take Back Initiative XV-April 28th 10 a.m. - 2 p.m.